CV – Caitlin Frances Bruce, PhD. M.A., Northwestern University, Department of Communication Studies, Rhetoric and Public Culture, Evanston, IL, 2010. Fellow in the Paris Program in Critical Theory, Northwestern University. Fall 2013-Spring 2014. Doctoral Student, Rhetoric and Public Culture, Northwestern University, Fall 2008-Spring 2014. 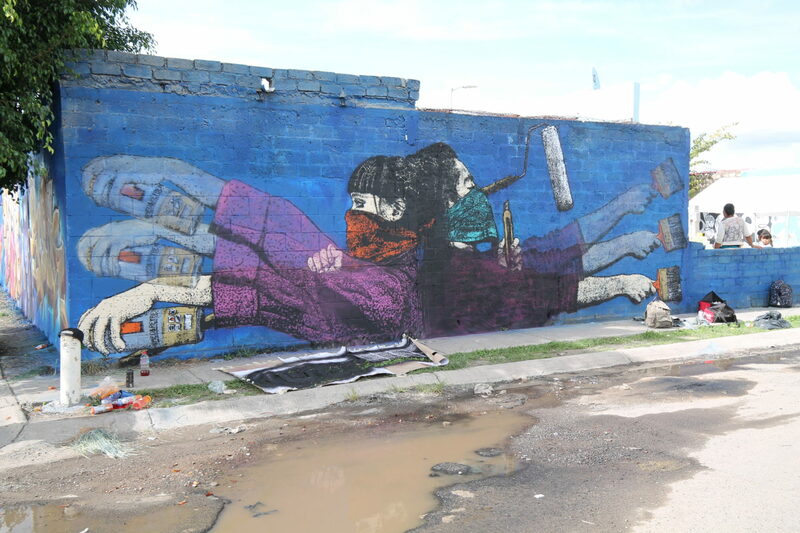 Citizen Voices in Aerosol: León’s Graffiti Worlds. In research stages. Anticipated publication: 2021. Cultural Text”. Public Art Dialogue 6, no. 2 (2016): 206-227, http://dx.doi.org/10.1080/21502552.2016.1205398. Culture & Critique 9, no. 5 (2015): 175-321. DOI: 10.1111/cccr.12109. Iconicity.” Communication and Critical/Cultural Studies 12, no. 1 (2015): 42-62, DOI: 10.1080/14791420.2014.989246. Invisible Culture 15 (2010): online. Identities”, In Conversation and Commentary Forum. Women’s Studies in Communication 39, No. 2 (2016): 147-152, DOI: 10.1080/07491409.2016.1176793. Plataforma Durable de Aprenizaje, Creación, y Empoderamiento,” In Propuestas Para León Elecciones 2018. David Mendizibal Martínez, ed. León, GTO: D.R. Promoción de la Cultura y la Educación Superior del Bajío, A.C., PROCESBAC, 2018.
impertinence of Urban Creativity, edited by Luca Borriello, Christian Ruggiero, Salerno, Italy: ArtiGraficheBoccia, 2013. Art Dialogue 6, no. 1 (2016): 159-160. Doi: 10.1080/21502552.2016.1149402. Transnational Iconicity,” Visual Communication Division, National Communication Association. November, 2015. Visual Communication Division Outstanding Dissertation Award at the National Communication Association, for the dissertation, “Transitional Art, Transnational Murmurs: Post-Revolutionary Urban Street Art,” November, 2014. Urban Communication Foundation, ECA Applied Urban Communication Research Grant, for the project “Citizen Voices in Aerosol? León’s Graffiti Worlds.” $2,500. AY 2018-2019. Camargo Foundation Core Fellowship, Cassis France, Spring 2018. $2,700. Declined. Fulbright García-Robles/Comexus Postdoctoral Fellow, Western Hemisphere, Mexico, AY 2017-2018. $20,100. University of Pittsburgh Humanities Center, Internal Faculty Fellow, AY 2016-2017 for the project “Citizen Voices in Aerosol: León’s Graffiti Worlds.” Awarded Fall 2016. Declined. Pittsburgh Council on the Arts, Pennsylvania Partners in the Arts Project Stream eGrant, $1,620, for the project “Hemispheric Conversations: Urban Art Program.” 2016-2017. Central Research Development Fund Grant, University of Pittsburgh, “Citizen Voices in Aerosol: León’s Graffiti Worlds.” $14,324. 2016-2018. Neighborhood Identities: Hemispheric Conversations.” $3,000. 2016-2017. Urban Art Project.” $5,000. 2016-2017. School of Arts and Sciences, University of Pittsburgh, “Citizen Voices in Aerosol: León’s Graffiti Worlds.” $3,500. 2015. WFI Faculty Research Grant, Villanova University Waterhouse Family Institute, Project Title: “León’s Graffiti Worlds: Citizen Voices in Aerosol, Graffiti as Communication Practice.” $5,000. 2015-2016. University of Pittsburgh. Project title: “From Periphery to Center: Transitioning Public Art Practices in Contemporary Mexico.” $4,000. Summer 2015. Hewlett International Grant, University Center for International Studies. University of Pittsburgh. $3,500. Fall 2015. Pittsburgh Center for Latin American Studies Faculty Research Grant, “Transitional Art, Transnational Murmurs.” $4,000. 2014. Northwestern University’s Center for Interdisciplinary Research in the Arts (CIRA) Grant, for the project, “Wonder, Movement, and Spectacle in Public Places: Investigating and Recovering the Shared Histories of Circus Art and Graffiti in New York and Chicago.” $3,000. 2013-2014. The Paris Program in Critical Theory Fellowship, Northwestern University. $21,000. 2013-2014. Honorable Mention, The Ford Foundation Dissertation Writing Fellowship, 2013. The Graduate School Graduate Research Grant, Northwestern University. $3,000. 2011. School of Communication Ignition Research Grant, Northwestern University. $2,000. 2011. Creative Cities Working Group, Stanford Arts Institute, May 11-12, 2018. Public Culture in Chicago, NEH Seminar at the Newberry Library, June 2018. $2,700. Capacious Conference, Spotlight speaker, Millersville University. August 8-11, 2018. Invited Presentation, “Métodos del Campo por la Retórica Visual,” in the Maestría en Communicación y cultura Digital, Facultad de Ciencias Políticas y Sociales de Universidad Autónoma de Querétaro, 24 January 2018. Invited Presentation, “El oficio de Investigador: El Financiamiento de Proyectos de Investigación,” Universidad Iberoamaericana León, 22 January, 2018. New Pittsburgh: Art, Gentrification, and Urban Communities. November 17, 2016.
International Society for the History of Rhetoric, Queens College, London. July 26-31, 2017. National Communication Association, Philadelphia, PA November 6-20, 2016. Visual Communication Division, Panel Discussion (organizer): Public Photography, Visualizing Social Difference, Engaging Civic Life. National Communication Association Convention, Chicago, I.L., November 19-23, 2014. Sponsor: Critical and Cultural Studies Division. Chair. Sponsor: Visual Communication Division. Panel discussant. American Studies Association Convention, Washington D.C., November 18-21, 2013. National Communication Association Convention, Washington D.C., November 18-21, 2013. National Communication Association, Orlando, November 14-18, 2012. Luis Miguel López, “La conversación mural de León,” Ruleta Rusa, 7 February 2019. http://www.ruletarusa.mx/historiasrr/la-conversacion-mural-de-leon/. José Antonio Castro Murillo, “Pone ejemplo León en Control de ‘grafiteros’” AM (León Guanajuato Mexico), A/2, 24 December, 2017. Dan Crawley, “Artists Brightening Once-Gloomy South Side Passage with Mural,” KDKA, May 2, 2017, https://www.google.com/search?q=kdka+south+side+mural&oq=kdka+south+side+mural&aqs=chrome..69i57j0l5.2909j0j1&sourceid=chrome&ie=UTF-8. “Artists work with Graffiti Watch to learn, display neighborhood’s history,” South Side Reporter, May 2, 2017 77, no. 44, http://www.sopghreporter.com/story/2017/05/02/front-page/artists-work-with-graffiti-watch-to-learn-display-neighborhoods-history/17704.html?m=true. Instructor of Record. Rhetoric of Space and Place. Instructor, Rhetoric and Culture, Upper Level Writing Seminar. Instructor, Visual Rhetoric, Upper Level Writing Seminar.